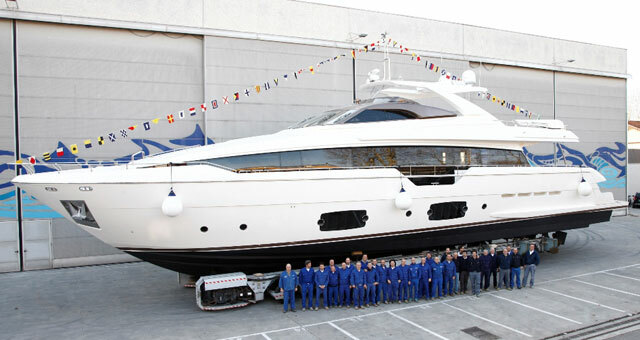 The Ferretti 960, the largest megayacht to date from Ferretti Yachts has just been launched and shall be presented at the Cannes Yacht Show in September. The most unique feature on the Ferretti 960 is the garage door which converts to a giant sun lounge, fitted with sunpads so it instantly becomes a beach club. Built to RINA classification, the 95’8” (29.2-meter) Ferretti 960 reflects sporty, aggressive styling that is characteristic of Ferretti Yachts. In keeping with features from the Ferretti 870 and 690 range the lowered bulwarks allow sensational views out to sea from the dining area. The styling was provided by Studio Zuccon International Project and Advanced Yacht Technology & Design (AYTD), the Ferretti Group’s in-house research and design team. The beam on this yacht has been stretched out to 6.7 meters) which can be nest appreciated in the massive full beam, main deck master stateroom. Four additional guest cabins are provided on the lower deck, all of equal size and luxuriously appointed. The crew on this flagship model for Ferretti Group shall also enjoy the privacy of 3 crew cabins and dedicated crew access to the galley, a feature more commonly found on larger superyachts. Another unique feature of the Ferretti 960 is the adaptable beach club, swim platform which lowers to allow the tender garage to partially flood and launch the onboard tender. A Williams Jet tender of nearly 15 feet (4.5 meters) shall be the standard inclusion however similar-size tender and toys can be stored in this garage. The Ferretti 960 is designed for performance as most other Ferretti Yachts craft are. The megayacht should acheive cruise speeds of around 24 knots and a maximum 27 knots with the standard MTU 16V 2000 M84 diesels engines. Optional 12V 2000 M93s or 16V 2000 M94s are available to boost this performance into top end speeds in excess of 30 knots. Please email if there are any positions. I am interested.